We offer a wide range of Tunnels with a temperature controller. There are live rollers inside the tunnels and also a conveyor setting. These products are made from high-grade raw materials using advanced technologies. Range of Industrial Shrink tunnel includes Industrial shrink tunnels. 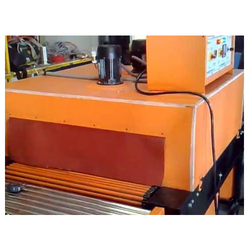 We provide Bus Bar Sleeve Shrink Machine to the clients. With the strong assistance of our knowledgeable professionals, we are able to manufacture, export and supply an extensive array ofLabel Thermal Shrink Packaging Machine. This machine is efficiently manufactured with the help of progressive methodology using the premium quality components under the stern guidance of our skillful technical experts. 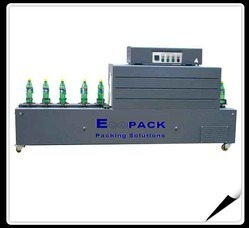 Offered machine finds usage in distinct industries such as food, pharmaceuticals, cosmetics, etc. Moreover, our valuable clients can avail this Label Thermal Shrink Packaging Machine in varied specifications at highly competitive prices. We are supplying shrink tunnel of various type, Roller1610 is the model of shrink tunnel which is very good quality industrial shrink tunnel. It has adjustale type tension setting for conveyor. This is used for various customized purpose in shrink tunnel. Silicone Sleeve Roller type conveyor. Adjustable tension setting for conveyor for balanced movement. Digital Temperature Controller – maintains temperature of 1 degree. Cool Down for Tunnel switch off..
Infeed 6” to the tunnel chamber. Silicon Cloth for curtains at Inlet and Outlet of Tunnel. Curtains of Silicon Cloth at inlet and outlet. Shrink Tunnel adopts the hot-wind down-cyclone structure, intelligence temperature control and AC variable speed regulation. There are two optional conveyors. Shrink tunnel are applied to heat shrinkable film such as PVC, POF, PP etc. Both the height of tunnel and shutters on two sides are adjustable. 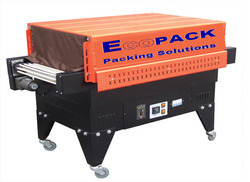 Shrink wrapping machine SP 4535L SP 6535L are designed with lengthened double hot wind tunnel for higher and better-shrinking effect. To shrink wrapping the combined products in the supermarket for sales promotion, such as foodstuff, beverage, cosmetics, presswork, and toy etc.